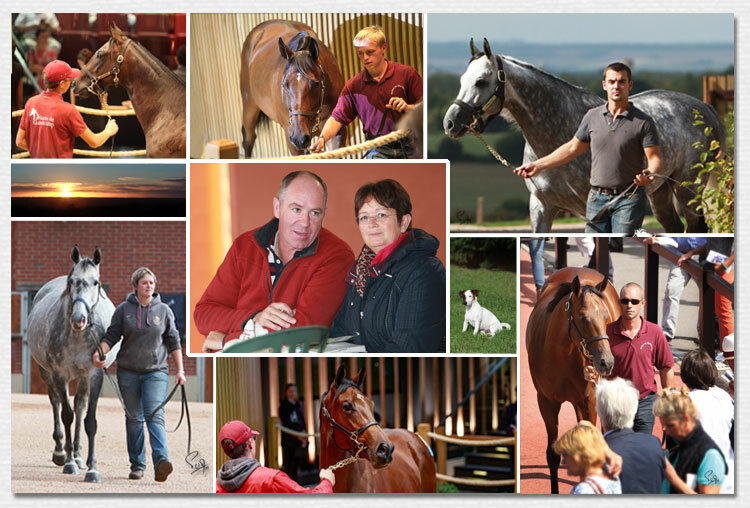 The history of our stud reflects the career path of its founder, Éric Lhermite. Through the years, he has taken on every role in the management and organisation of a stud farm, from night watchman to groom, from stable lad to management in the major international stud farms. In the course of a twenty-year career, he has worked and learned at the “De Roiville”, D'Omméel”, “Du Buff”, “Du Mezeray” and “D'Etreham” studs, his knowledge and understanding as a horseman and hands-on operator growing with each new role, along with his judgement and personal satisfaction as a rider. Éric's breeding experience is broad, ranging from birth to the specific needs of each horse at every stage of its life. Boarders are guaranteed an individualised care plan and treatment that ensures the best possible outcome for each and every horse. His sales experience is equally broad, and includes experience of international sales: you can be sure of his awareness and competence within the various sites, and of his perfect knowledge of the various actors operating in these places. Éric and Isabelle Lhermite first established the Haras de Grandcamp identity in 2004, when they set up their first stud close to the Poite du Hoc in the Calvados department. Having found their current premises in 2006, they quickly realised the potential of its location and ease of access. This farm had historically already operated as a stud, and witnessed the birth of some remarkable horses, including the now well-known French trotter “Tipouf” and winning thoroughbred stallion “Blackdoun”. Our team is young, dynamic and always on the quest for perfection. * and Sarah’s husband Romain. Team Grandcamp is a family-based, close-knit team, in which everyone rides, looks after the horses and is able to turn their hand to any task required. In the interests of efficiency, Gaël manages everything related to working the young horses: breaking in, pre-training and preparing them for breeze-ups, as well as getting them ready for yearling sales. Romain manages the stallions, and is very actively involved in preparing the yearlings. The core team of around fifteen full-time staff is involved in preparing for sales, presenting, caring for the horses, pre-training, and in maintaining the farm. Every team member has a specific and important role, but our success also comes from actively managing every last detail. Veterinary exams of horses to be sold, or of mares in foal and their offspring are very important to the breeding programme. Our vets are in this sense an integral part of our team, along with a farrier, an osteopath and an equine dentist. The Haras de Grandcamp team under Eric Lhermite is a strong, united and pragmatic team, on a perpetual quest for improvement and is devoted to “its” horses at any time of the day or night – our horses’ needs are more important than our own. Our team combines youth, experience and dynamism, in a set-up in which people know and respect each other, and whose overarching values are discretion, service and efficiency. The main part of the farm is located in the village of Trun, on either side of a hill surrounding the main body of the farm. Yearlings are prepared here throughout the summer and autumn, whilst winter and spring are devoted to foaling and breeding, activities involving the entire team. In 2016, the Haras de Grandcamp set up a second site in Lisores in the Calvados department, taking over a former cattle farm that had never had horses on it before. This autonomous, self-sufficient farm has its own installations, but is devoted largely to bringing on both our young horses and those that are entrusted to our care. These two farms add up to 200 hectares (around 500 acres). The meadows are on a variety of soil types, enabling the stud farm to achieve the best possible year-round use of the natural resources. Soil quality is regularly analysed in order to ensure the balance required in rearing horses. The land unfolds in gentle natural slopes, perfect for encouraging harmonious muscular development of foals, and is enclosed with wooden stock fencing to ensure safety. The countryside around the Haras de Grandcamp, its location, and its calm setting all contribute to the wellbeing of our horses. Our farm does not produce its own hay cereals and straw, in order not to overcrop the meadows and to better control feed quality. 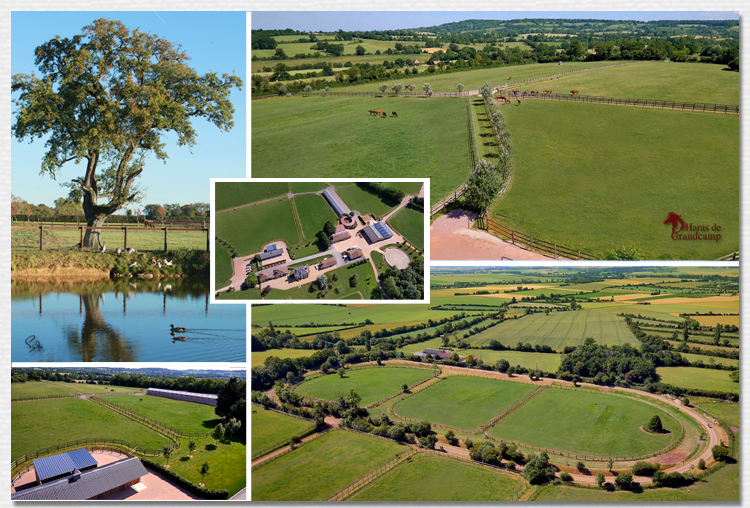 The stud's meadows, fences and buildings are all maintained in-house thanks to the skills and knowledge of its staff, and its available range of equipment. Our stable complex includes 115 units -with 30 more in the pipeline for 2019- around a courtyard facing south-east. They are arranged in several different barns, one of which is reserved for the stallions. These stables are self-contained to ensure more peace for every horse. The internal architecture of the stables is however arranged to allow the horses to see each other, crucial for the needs of herd animals. We also have large 6 foaling stables, each equipped with CCTV. Mares not in foal are kept under artificial lighting to ensure that they are ready to be mated from mid-December. 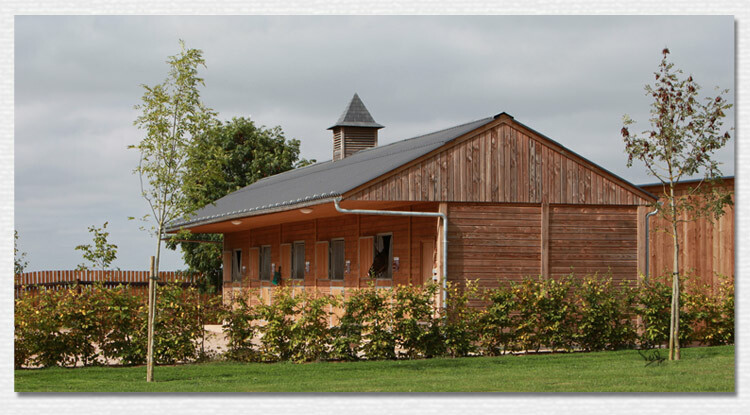 Our stables are mechanically ventilated in the summer for the comfort of our boarders. There are two training tracks at the stud- one is circular, for walking the foals, for pre-training or prepping for breeze-ups; the other is straight, with a slight slope. For relaxation, exercise or muscular training, there is a treadmill, four lunging pens, and three automatic walkers each for 6 to 8 horses. These are the skills, human and material resources that the Haras de Grandcamp makes available to your horses, whether for a short stay or for year-round livery. We guarantee that your horses will be looked after to the highest professional standards, with care and devotion, and constantly seeking the best results.